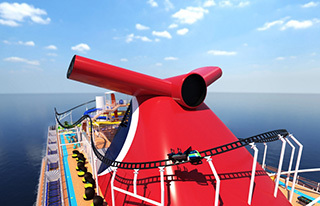 In another cruise industry first, Carnival Cruise Line’s Mardi Gras will feature the first-ever roller coaster at sea when it debuts in 2020. Built by Munich-based Maurer Rides, BOLT: Ultimate Sea Coaster promises a heart-pounding rush of adrenaline offering nearly 800 feet of exhilarating twists, turns and drops with riders reaching speeds of nearly 60 kilometres per hour. BOLT is an all-electric roller coaster that allows two riders in a motorcycle-like vehicle to race along a track 187 feet above sea level, enabling guests to experience the sea in an exciting new way with 360-degree views. The ride will begin with an action-packed launch where riders can achieve race car-like levels of acceleration and culminates with a high-powered hair-pin turn around Carnival’s iconic funnel. Riders’ speeds are posted after the race, and just like land-based roller coasters, guests have their photo taken during the ride for a memorable keepsake. And since guests choose their own speed, each ride is unique. Christine Duffy, president of Carnival Cruise Line, said BOLT is the cornerstone of innovations and features being designed for Mardi Gras. Mardi Gras will be based in Port Canaveral, Fla., which will feature a new state-of-the-art terminal. Itinerary information will be revealed early next month with additional details about Mardi Gras’ features announced throughout the year. A second XL-class ship will start construction in 2020 and be delivered in 2022 to mark the 50th anniversary of Carnival Cruise Line’s founding.